Pope Francis welcomed PA President Mahmoud Abbas to the Vatican today, calling him "an angel of peace." 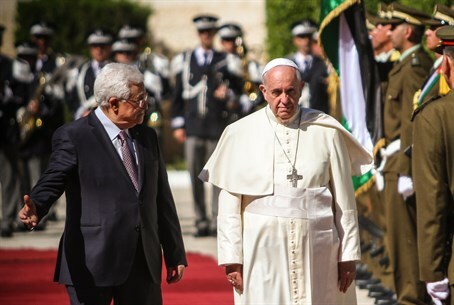 Pope Francis warmly welcomed Palestinian Authority (PA) President Mahmoud Abbas on the latter's visit to the Vatican today (Saturday). The Pope even went so far as to call Abbas "an angel of peace." Though he is Muslim, Abbas flew to the Vatican in order to participate in tomorrow's canonization of two new Arab saints. The two nuns lived during the 19th century in what was then known as Ottoman-ruled Palestine. Pope Francis's compliment towards Abbas came when the two exchanged gifts. The Pope gave Abbas a medallion that represents the angel of peace defeating the "bad spirit of war," and said that it is appropriate because "you are an angel of peace." In return, Abbas gave the Pope relics from the new saints. In addition to celebrating the new saints, the Holy See recently announced that it has worked out a treaty with the "state of Palestine," cementing its decision two years ago to recognize the "country." The Vatican's deputy foreign minister, Antoine Camilleri, expressed his hope that "the accord could, even in an indirect way, help the Palestinians in the establishment and recognition of an independent, sovereign and democratic State of Palestine." Israel's foreign ministry reacted strongly to the treaty, saying, "Such a development does not further the peace process and distances the Palestinian leadership from returning to direct bilateral negotiations. Israel will study the agreement and consider its next step."